Beachgoers on Sunday should stay alert! Potentially dangerous rip currents are expected. 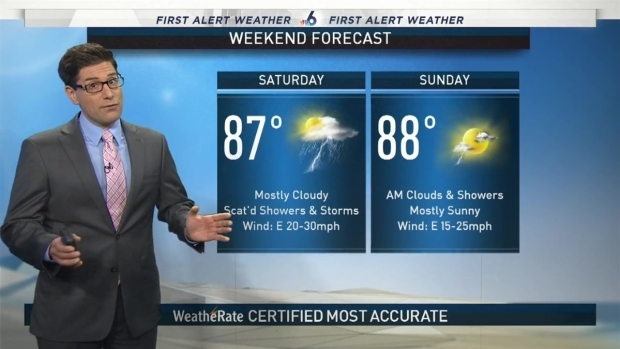 If you plan on being out on the water in South Florida this weekend, be careful. Wind gusts up to 25 mph throughout the weekend pose potentially dangerous conditions at the beach. There will be a high risk for rip currents, so beachgoers are advised to only go in the water if there is a lifeguard on duty. A small craft advisory has been issued and will remain in effect until at least Saturday night. Boaters can expect East-Northeast winds 15-25kts leading to 4 to 8-foot waves and choppy waters on the bay. The combination of the on-shore winds and astronomical high tides is predicted lead to minor coastal flooding in some areas with each high tide throughout the weekend. Unsettled weather is expected all day today with mostly cloudy skies, on and off showers. There could also be minor coastal flooding at the following Miami high tides times: 11:00 a.m. Sunday, 11:07 p.m. Sunday.